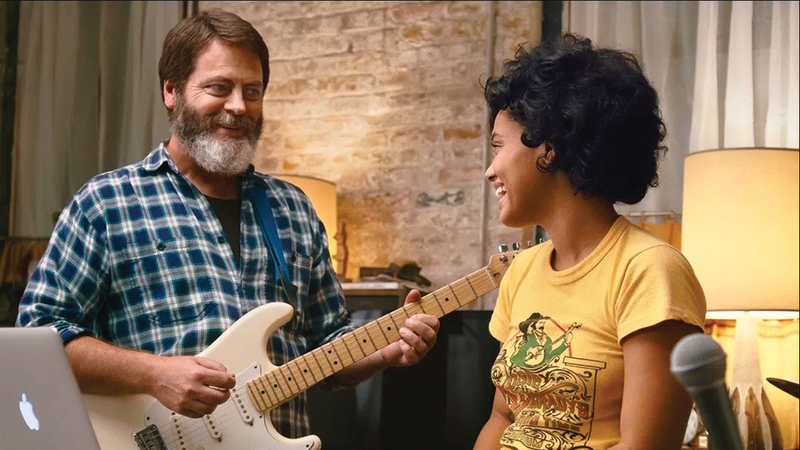 “Hearts Beat Loud” opens with Frank Fisher (Nick Offerman), record store proprietor, lighting up a cigarette in his own shop and telling off a customer who tells Frank to put the cancer stick out. The light confrontation is a feint, seeming to set up this widowed father of one as a malcontent when he proves to mostly be a music obsessed teddy bear, but it also establishes the fact that his record store is not long for this world when the irate customer goes outside and buys the album he was seeking to purchase through Amazon in a smartphone flash. The ensuing scene finds Frank’s daughter Sam (Kiersey Clemons) in a pre-med summer course, prepping for UCLA in the fall, illustrating Sam as being focused where her father is distracted. And if the record store signifiesFrank being bound to the past, his daughter’s class demonstrates her looking toward the future, and it is in the middle where they do not collide in this earnest musical comedy so much as haltingly, and then winningly, meet, if only fleetingly. A great pop song, after all, only lasts a few minutes. The film’s kindling is a father/daughter jam session – him on guitar, her on keyboards – where he discovers she’s just written a song, suggesting Allison Russell fronting Frightened Rabbit, which they then quickly record in a lively montage. It’s the moment just before, though, when Frank first hears her synthesizer line and then finds the right guitar notes to accentuate it that really resonates. As this happens, as Frank drifts closer to Sam, the camera drifts closer to them both, underlining the musical harmony, a moving portrait of how father and daughter are drawn close over music even as life’s altering paths are pushing them apart. He’s itching to use this song as the cornerstone of forming a father/daughter band, using it to spiritually delay his shop’s slow slide into oblivion, while she rightly yearns to focus on the future. Still, he uploads their track to Spotify and when he realizes it is the modern version of a hit for the Soundcloud age, the scene revels in a wonderful homage to “That Thing You Do!” where Frank magically hears his own tune not over the radio but in a coffee shop. 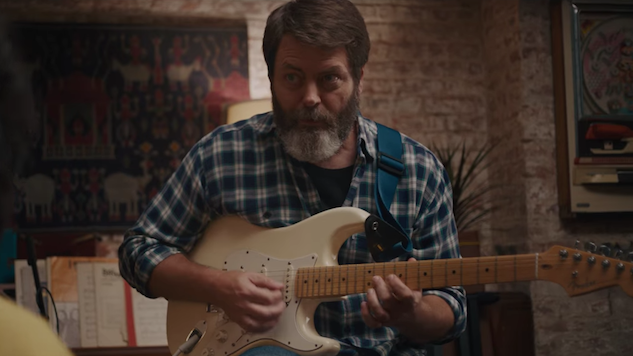 And the way he tells taken-aback patrons “that’s my band” and then joyfully sprints down the street, a la Liv Tyler, my mind could not help but flash back to Offerman as the glorious crank Ron Swanson on NBC’s sitcom “Parks and Recreation.” There I never really noticed his blue eyes which in “Hearts Beat Loud” frequently pop off his salt and pepper beard, really making him look like a little kid, an exuberant Swanson opposite. That’s the problem, of course, his adult pipe dreams set against the wariness of a reality his daughter preaches, an ancient script just with the ages flipped, though director Brett Haley’s easygoing presentation of this script overcomes its familiarity; he never hammers away at these ultimate truths, he just lets them simply, intrinsically arise. That also goes for Sam’s transitory summertime romance with a burgeoning artist (Sasha Lane) that both characters are adult enough to admit can’t last. Frank’s semi-romance, meanwhile, with his landlord Leslie (Toni Collette), has the one plot point, their second act relationship downturn, where the gears turn too obviously, though it’s offset by Collette and Offerman’s natural chemistry. If the dialogue might be intended to represent a kind of lyrical anthemic quality, it nonetheless too frequently trends toward slogans nailed to the metaphorical wall and proves more successful when the words are nothing much yet invested by the actor in question with considerable quality, like Offerman declaring “It’s fine” in such a way that suggests it’s absolutely not fine. And for all the verbal exchanges between father and daughter, nothing resonates more than the smiles and laughs they share during their band’s lone performance. It is a musical movie, after all, one in which scene after scene after scene is adorned with carefully curated pop music cues, honoring its record store roots, and so it concludes with Frank and Sam playing a short show for a sparse, inadvertent crowd the night his shop closes. At one point during their last song Haley switches to a shot of the camera looking up, the lights on the store ceiling bouncing off Frank and Sam in such a way that it appears as if they are on a stage, rock stars, a cheerier version of The Beatles’ rooftop concert, one last jam session before the currents of life carry them away.